One of the biggest thrills of this job creating bridal jewellery and headpieces, is when one of our real life brides (in this case Helen) sends us a lovely email with pictures of our sparkles on their big day: candidly, both Rebecca and I are women obsessed with all things wedding (just as well eh?!) and it makes us smile an awful lot. Being as we’re both very happily married ourselves, we have to live vicariously thorough YOUR wedding days, and we adore getting an insight into how our pearl and bridal accessories metronidazole generic equivalent have made a little piece of someones day shine. 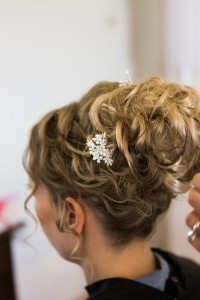 Helen wore three of our Abigail pins on her day with a beautiful up do. “Just wanted to say thankyou so much for my lovely pearl and crystal bridal hair pins which I absolutely adored and wore all day. My bridesmaids all loved their pearl bracelets too. Here are a couple of photos from the big day.